Whether testing performance of an application, Mac OS X animations, or just out of general curiosity, you can measure the refresh rate in Frames Per Second of onscreen actions and animations on the Mac by using a free developer tool from Apple called Quartz Debug. 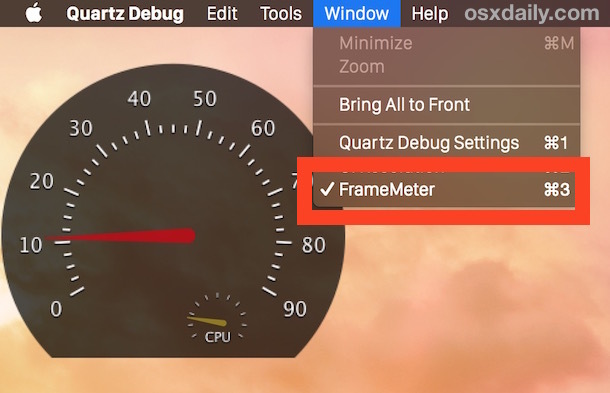 Part of the Graphics Tools package of Xcode, Quartz Debug can also be downloaded separately if you have a developer login, and a simple action will enable the live FPS monitor, providing frame rate data in real-time. When the FrameMeter shows up place it somewhere appropriate for your usage and start interacting with Mac OS X or an application to immediately see how the FPS and CPU gauge changes live, showing you the frame rate of onscreen activity. You’ll notice the FrameMeter looks like a little dashboard tachometer of sorts, displaying FPS and CPU usage simultaneously. With FrameMeter enabled, just interact with Mac OS X or an application and you can see how frame rate and processor usage is impacted. Even something as simple as resizing a window or scrolling through a Finder window with Mac OS X Yosemite transparencies is notable, and similarly, you’ll find that using something like Increase Contrast, which disables the transparent effects as well as making interface elements more defined, has a side effect of boosting FPS and reducing CPU load during those type of tasks. As a developer tool, this is mostly intended for performance testing of applications, but it can still be an interesting way to benchmark some aspects of Mac OS X, or at least see how certain activity may or may not impact the visual performance on a Mac. It can also offer a way to directly see the performance boosts offered by tricks like these to speed up Mac OS X Yosemite, particularly on older hardware. Quartz Debug is an interesting utility, you can use it to enable Retina HiDPI mode on old Macs that don’t even support a Retina display (which, some time ago, this was one of the big hints that Retina displays were coming to the Mac), though it’s basically unusable so don’t be fooled into thinking you’ll suddenly have a better display experience. The entire Graphics Tools suite is actually pretty fun to have around on a Mac if you’re the tinkering type, Quartz Composer in particular is good fun to play around with, as it allows you to make or edit fancy animations and screen savers like this one in Mac OS X. These are the days MAC users are very crazy to know their Frame per second. Very useful Live tip. Thank you admin. When I go to the download link and search for it, it is not there. Is anyone else not seeing it? This is free to do, it does not need to be a registered or paid developer account to access the tools. A paid account is only required to submit apps to the App Store and access beta IPSW for iOS and beta downloads for Mac system software – both of these are largely available to average users through the Public Beta programs anyway, so the paid accounts are mainly for app store sales and submissions. I did, I read the instructions, and got the dmg, and now I have it. Did you? Because you need to download Graphics Tools from the Apple Developer website that is linked in the article, then mount that disk image to get the Quartz Debug tool. On a brand new top of the line 2015 MacBook Pro 13″ Retina Display here, it maxes out at 22FPS when using Quick Look in the OS X Yosemite Finder with a few apps open. Frankly it looks choppier than that, with significant stuttering and skipping frames in the animations, which is perhaps how it achieves even 22FPS by dropping 50% of the frames of the animations. Meanwhile, “WindowServer” in Activity Monitor strains CPU at 80% during basic activities like moving windows around in Finder, or again, using Quick Look. Resize icons in Finder, and have a few Finder windows open, and you’re able to get Finder process to hit 80-90% CPU usage as well. On a brand new Mac! This thing is a few days old, barely anything installed on it, with the fresh install of OS X 10.10.2 that shipped with the Mac. OS X Yosemite has just awful performance, hard to believe this is a new computer. It feels slower than the 2011 MacBook Pro it replaced because of Yosemite! I hope OS X 10.10.4, 10.10.5, OS X 10.11, etc, fix the performance issues here. I will never buy another Mac if they can’t iron out the kinks, a $1900 laptop should be wicked fast, not stuttering to display a simple file system animation that is flawlessly fast on ancient hardware with better optimized software. Great feature isn’t it? WindowServer is currently taking up 40-50% CPU just typing this comment in OS X Yosemite. I don’t recall WindowServer going above 4% in OS X Mavericks. This is a feature, right? By generating excess unnecessary CPU usage, my MacBook Pro is warmer than ever doing few tasks, which on this cold spring day makes my hands feel warmer. After I updated my MacBook Pro to Yosemite it renamed itself HandWarmer Pro, amazing! How considerate of Apple and Jony Ive to make those Yosemite effects double as a hand warmer! Apple thinks of everything! I am going to buy another $6000 of Apple Kit this year, I hear the corporation is having some financial difficulties, and with this kind of hand warmer technology embedded into OS X Yosemite I want to contribute to them because innovation means a slower, warmer computer. It’s a machine with an IGP, so yeah it will dump tasks like that onto the CPU. My 2011 iMac uses about 9% of the CPU to move a Finder window in 10.10. Don’t blame the OS, it’s the hardware. This Tool is nearly useless in the first 10 Minutes, because when i move a Finder-Window the “FrameMeter” swings around 20-32 Frames. The Finder-Window itself is refreshing around 5-7 times per second and not with 20-32 fps. Mac OS 10.10.2 is extremly slow in Graphics compared to Mac OS 10.6.8. Update: Around 10 Minutes later, the moving Finder-Window is now refreshing to real 52 fps. Any reasons why this happen ? I agree, my animations and refreshes are so choppy in OS X Yosemite that I have never seen any new computer operate so slowly. 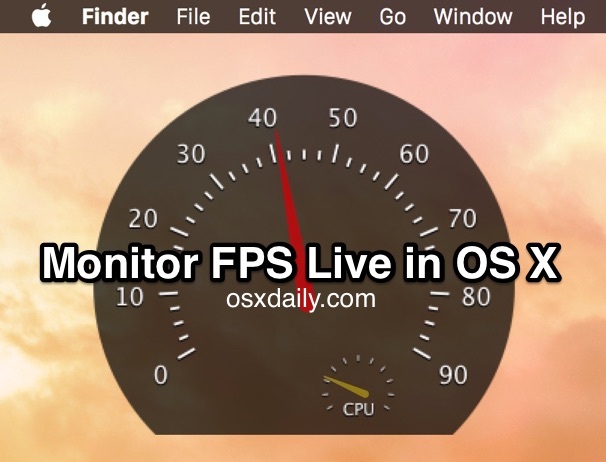 I think Apple is juicing the numbers with this tool, I do not think the FPS meter is accurate. If you can see frames and choppy animations, that is not a smooth or consistent frame rate. Mine says 30 FPS, there is no way it is FPS doing anything. It works great for me on El Capitan with my 2015 Retina MacBook Pro. Thank you! do you know how can i disable the VSYNC ( Beamsync ) with the Graphics tools 7.2 ? This article is still valid. 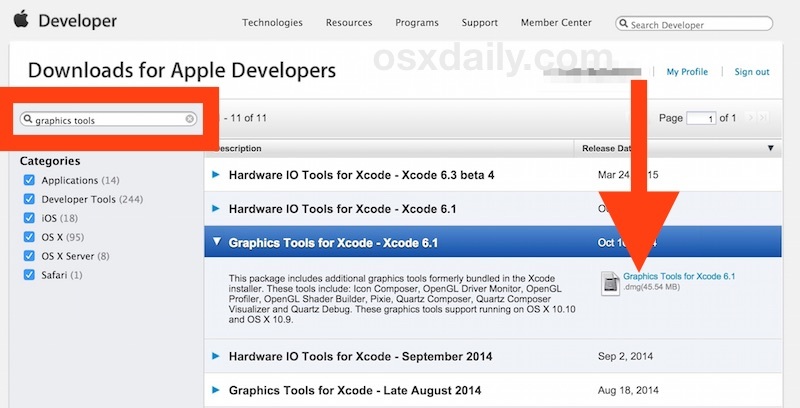 However, nowadays you need to search for “additional tools” instead of graphics tools. Quartz composer for Xcode 9 is in there.